Fourteen rootsy, folksy tracks inspired by lines from "A Hard Rain's a Gonna Fall." Thoughtful, funny, pretty, sad - pretty much a little bit of everything. First volume of three. In the liner notes to the 1963 album “The Freewheelin’ Bob Dylan,” Dylan is quoted as saying, “Every line in [A Hard Rain’s a Gonna Fall] is really the first line of a whole other song.” I have always been intrigued by that. in 2009 I set out on a project to write songs inspired by those 37 lines. This is the first volume of the songs that resulted from that endeavor. Although the songs are mostly written in a rootsy folk, a style of music whose popularity owes a certain debt to Dylan, these songs are not an attempt to imitate him , or to try to write the songs that he would have written, but are my own personal expression inspired by the lines of "Hard Rain." It was an amazing journey throwing myself deep into the lines of that song - I hope you enjoy these and I look forward to sharing the rest with you soon. All of these songs were written and recorded in February 2009 as part of February Album Writing Month. 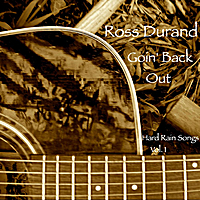 Ross trusted some of us to hear early versions of these songs shortly after he'd composed them. While clearly Dylanesque, they aren't a slavish attempt to sound like the man. Each has its own sound, some happy, some sad, some dark and some shining like the sun—as does my favorite, "I'll Know My Song Well" which deserves to be a hit. Durand's playing is tight and clean. His melodies are memorable, hummable, and he makes excellent use of his distinctive voice. The project would be laudable simply for the mad scope of writing 37 songs Dylan meant to, but hasn't yet. Hurrah for the fact that it's musically worthwhile as well.